village PDX | Independently Aging....Together! People often think that volunteers aren’t really needed until you launch the Village and begin delivering services to paying members. This couldn’t be further from the truth. The process of developing and promoting the Village is “volunteer heavy,” as this list of current Eastside Village volunteer opportunities demonstrates. And the list doesn’t even include developing the community needs assessment survey, building the website, delivering Village 101 presentations, or the countless other tasks already being done by Planning Group members! Still, this list should give you a pretty good idea about the type of tasks that need doing at this stage of the Village development process and how many volunteers we hope to recruit to do them. Home Hosts: Invite your friends and neighbors to Village 101 informational meetings you host in your home. We’ll provide the presenter/you provide the guests & refreshments. Community Builders: Follow-up with people who attend presentations or who signed-up through the website. Discover their needs & interests, how they might volunteer, skills & talents they have to offer. Make sure they’re on the Village email list and invited to social activities and educational programs. Introduce self in person at events. Volunteer Recruiting & Placement: EastsideVillage, PDX operates primarily with volunteers—not just after we open and need volunteers to deliver services to members, but right now in the development phase. So, volunteer recruitment is a MAJOR priority! This volunteer position works with the Community Builders to find the right volunteer activities for new people; keeps track of the type of volunteers that are needed and gets that information to all the PR/Outreach people to publicize; brainstorms & implements strategies for recruiting additional volunteers; and contacts existing volunteers to ask for their help when/where needed. Volunteer Tracking: We need to keep track of all our volunteers and their hours for grant writing purposes—in addition to being able to thank them for everything they do! To do this, we need a volunteer tracker who will set up and maintain a tracking system so we know who is doing what and how often they are doing it. Survey Team Members (Spring 2013): Help our Program & Services Committee with the surveying process by helping to brainstorm group/sites to assist with survey process; reaching out to those groups/sites to request their help; delivering surveys to & collecting them from participating groups/sites; assisting at survey events & focus groups. Social Event Team: Do you like to plan and host potlucks, holiday celebrations, and social gatherings? If so, this is the volunteer slot for you! Social events are an essential, ongoing part of the Village, so we need a team of socially-inclined folks to plan fun, community-building social events, find low/no cost sites, and coordinate all the details, including volunteers, set-up, clean-up, activities/programming, and food. Educational Programming Team: Another ongoing part of the Village is educational programs, speaker/lecture series, and discussion groups, covering a wide range of topics of potential interest to our members. So we need a team of folks to plan this kind of programming, find low/no cost sites to hold them at, and coordinate all the details, including recruiting volunteer presenters, set-up/clean-up help, AV equipment & support. Food & Snacks Team: Are you a whiz at grocery shopping? Do you love to bake and cook? Are you the person who usually takes care of the refreshments? If so, we need you to be part of the team that plans, buys, prepares and sets up the refreshments for Village 101 presentations and educational programs. Newsletter Writers/Editors: We need writers/editors to put together the copy & photos for email and print newsletters (going out 4-6x per year), describing the progress of Eastside Village PDX, recruiting volunteers, and inviting people to upcoming Village 101 presentations, social activities, educational programs, and fundraising events. Poster/Flyer Distribution: We’ll be making posters and flyers to get the word out about EastsideVillage and upcoming Village 101 presentations, social activities, educational programs, and fundraising events. So we need your help to identify locations and get them distributed and displayed on bulletin boards and in shop windows throughout the neighborhoods inside our boundaries. Get us on the Web: Help promote upcoming Village 101 presentations, social activities, and educational programs by getting them into online calendars & listservs, promoting them via social media, and sending the info about them to groups/organizations for their websites & e-newsletters. Media Liaison/Press Release Specialist: Write and send out monthly press releases highlighting upcoming Village events open to the public, including Village 101 presentations, social activities, and educational programs. Expand on and maintain press list. Follow-up with media after sending releases. Develop story angles and ways to get more media coverage/exposure. Tabling: (Seasonal/late Spring/Summer 2013) We have received grant funding to do outreach at many of the festivals and street fairs that occur within our boundaries (i.e. Clinton, Belmont, Hawthorne), but we need an outgoing team of volunteers to staff the tables (probably in shifts), and do the set-up and tear down. PR/Outreach to Faith Communities: Identify and help make connections/partnerships with the faith-based organizations inside the EastsideVillage boundaries. Set up opportunities to meet with their leaders; do presentations to their members; enlist their help to promote the Village; keep them informed about upcoming Village programs open to the public; figure out ways we can be mutually supportive. Also, identify any that have low/no cost space we can use for programs and/or which might be suitable as the site for the Village office. PR/Outreach to Neighborhood Associations: Help make connections/partnerships with the 13 neighborhood associations inside the EastsideVillage boundaries. Set up opportunities to meet with their leaders; do presentations to their members; enlist their help to promote the Village; keep them informed about upcoming Village programs open to the public; figure out ways we can be mutually supportive. PR/Outreach to Senior Organizations/Programs: Identify and help make connections/ partnerships with all the senior centers/organizations inside the EastsideVillage boundaries (or serving EV residents). Set up opportunities to meet with their leaders; do presentations to their members; enlist their help to promote the Village; keep them informed about upcoming Village programs open to the public; figure out ways we can be mutually supportive. PR/Outreach to Community Groups: Identify and help make connections/partnerships with general (not just senior-focused) community groups inside the EastsideVillage boundaries whose members might be interested in our work. Set up opportunities to meet with their leaders; do presentations to their members; enlist their help to promote the Village; keep them informed about upcoming Village programs open to the public; figure out ways we can be mutually supportive. PR/Outreach to Business Community: PR/Outreach to Community Groups: Identify and help make connections/partnerships with all the neighborhood business associations inside EastsideVillage boundaries. Set up opportunities to meet with their leaders; do presentations to their members; enlist their help to promote the Village; keep them informed about upcoming Village programs open to the public; figure out ways we can be mutually supportive. Also, identify businesses inside our boundaries that would potentially be good “Village Supporters” for the Fundraising Committee & help them connect with the owners. Business Plan Developers: If you have a strong background in financial or business planning, we need your help to develop and write the Village’s business plan. Fundraising Events Team: If you have interest in or experience planning fundraising events, we need your skills to put together a series of diverse, fun, creative events/activities to raise the funds needed prior to launch. Help research events/activities that have been done successfully by other Villages across the country and figure out how to adapt them for EastsideVillage, PDX. Recruit sponsors/underwriters/event partners. Plan and manage event logistics and volunteers. Solicit in-kind donations. Lots to do here and lots of help needed! Speakers, Musicians, Comedians, Chefs, Other Talent: Got talents to donate either in an educational program or at a fundraising event? If so, EastsideVillage needs you! Founding Board Members: Later in 2013 we will be recruiting members for the Founding Board of Directors. Stay tuned for information about the skill set, experience and expertise we are looking for in the first, critically important Board members. Planning Group Members: The Eastside Village Planning Group meets approximately once per month (plus committee meetings) and is open to anyone who is interested in planning and committee work. As you can see, there’s lots to do, and we hope to find lots and lots of volunteers to help do it. There’s an old saying: “Many hands make light work.” This seems to be particularly true when developing a Village. I am also hoping that “The more, the merrier” also applies. If you live on the eastside of Portland and are interested in any of these volunteer opportunities, please email info@EastsideVillage.org. Your hands and help will be most welcome. Our planning group recently sent out an email announcing the Eastside Village, PDX project and inviting people to come to a “Village 101” informational presentation to learn more about it. One of the pieces of information included in the email was the boundaries of the area that will be served by Eastside Village, PDX. Since the announcement went to everyone on our email list regardless of where they live, we knew that some of the people receiving it would be outside the Eastside Village boundaries. But what we didn’t anticipate was the number of emails we would get from people living only slightly outside the boundaries wanting to know why we “drew the line” where we did. Each of the emails pointed out that there were seniors living outside our boundaries who would benefit from Eastside Village services & support. Each of the emails asked why we couldn’t just extend the boundaries a bit more. And several of them pointed out how under-served their area is compared to some of the neighborhoods which are included in the Eastside Village service area. We did our best to send back a thoughtful response to everyone who wrote. We didn’t mention how emotionally difficult it is to set boundaries, knowing as you do that this will result in people who are inside the lines and people who are not, and that this is not a commentary on how much those on the outside need the services or how deserving they are of having a Village in their neighborhood. It’s about manageability—what the Village can reasonably address—-and about where the Village’s founders happen to live. Because whether you want to or not, in a city the size of Portland, you have to draw the lines somewhere. The Portland metro area is too big to be served by a single village. It would be unmanageable and ineffective. It didn’t help, of course, that we would like to be able to help everyone and that we understand both how well considered and how relatively arbitrary the boundaries really are. I suppose we could have said, “These are only ‘working boundaries’ so maybe we’ll decide to include your neighborhood further down the road.” It’s not like that’s impossible. A number of Villages across the country have expanded their boundaries to include more neighborhoods than they originally started with. Of course, in most of those cases they started out too small and needed to expand in order to survive, which is not the case with Eastside Village, which is starting with a very large service area. But it might happen…. 1. The village boundaries were set by vote of the entire planning group, after studying census numbers and considering “natural” and neighborhood boundaries. 2. In the process of studying villages nationwide, we learned that about 10-12K seniors in an area is the right size for a urban village. So we chose an area that has that number of senior residents. 4. 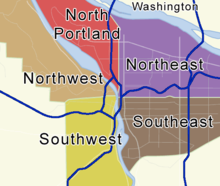 The street that is our south boundary is also the southern boundary for three of the neighborhoods that are part of Eastside Village, PDX. So it is a natural ending point. If we had extended to the next major boulevard south as you asked, we would have been able to include all of your neighborhood, but would have bisected two other neighborhoods—–who then might reasonably have asked us to extend even farther south so that all of their neighborhood would be included. 5. In terms of need, there is as much argument to be made about the problems of cutting off a village at our eastern boundary as there is at our southern boundary, since there are many, many seniors in need living further east. But you have to draw the boundaries somewhere. Trying to put all of Portland’s east side into one village would be unmanageable and, in the long run, counter-productive. 6. We hope Eastside Village, PDX will be the FIRST village on Portland’s east side, but not the ONLY one. Some of us are very willing to help start a “sister” village to the south which would include your neighborhood. But in order to get that going you need to find a few residents of your neighborhood (and surrounding neighborhoods) to host Village 101 informational parlor meetings. Through those parlor meetings, you will attract a core group of people to make up your village’s founding team/planning group. So find those people to host and we will be glad to come down, make a Village 101 presentation, and help get the ball rolling. I don’t think what we said was unreasonable or unsympathetic. I very much fear it wasn’t what any of the people who wrote wanted to hear. It would have been easier if we just extended the boundaries. It would have been easier if they didn’t have to build a planning group and mobilize their neighborhoods into action. But since that’s precisely what every neighborhood has to do to build a Village in the first place, it’s a pretty good indicator of whether or not their area can develop and sustain a Village in the long run. Eastside Village, PDX: It’s not a PLACE. It’s a PLAN for aging-in-place. Modeled after Beacon Hill Village in Boston, Eastside Village, PDX is not a building or a real estate development or a retirement community. Rather, it is a group of like-minded people who live within the same geographic area who have come together to develop the resources they will need to age comfortably in their own homes. There are currently over 90 of these Villages in existence—including Villages in Bend, Ashland and Seattle—with over 100 more in development across the country. The primary purpose of Eastside Village, PDX will be to assist older adults and people with disabilities to live at home safely, affordably, happily and healthily for as long as they choose by creating a coordinated network of volunteer and reduced cost services that supports village members to “do as much for as little cost for as long as possible.” Village membership will be open to anyone age 18 or older so that people with disabilities who aren’t yet seniors may benefit from its services and support. 122nd on the east (except between Stark and Division where the boundary extends out to 130th to include all of the MillPark neighborhood). The EastsideVillage planning group hopes to file for 501c3 status by Fall 2013 and launch the Village by the Fall of 2014. Their fiscal sponsor for this project is a local nonprofit organization Health Advocacy Solutions, who will be assisting them with grant applications and processing their tax-deductible donations until they get their own 501c3. One of the key steps to Village formation is to survey potential members and volunteers living throughout the Village’s service area in order to learn (1) what aging-in-place programs & services they would want from the Village; (2) what programs & services they are currently receiving; (3) what they are paying for the services they are currently receiving: (4) what they would be willing to volunteer their help with. The Eastside Village programs & services committee is currently designing a comprehensive needs assessment survey (both print and online forms) to collect this information and plans to devote the month of May 2013 to surveying (launching on 5/1). Space is limited, so please RSVP to info@eastsidevillage.org or call 503-489-8496 to reserve your place. Trying to Figure Out the Size and Boundaries for a Portland Village: What’s “Just Right”? Last night was the first parlor meeting for the Village PDX project. Seven smart, interesting, inquisitive folks showed up and we had a wonderful discussion with lots of insightful comments and questions. So a great way to kick-off the first of 5 parlor meetings happening over the next 3 weeks. The parlor meetings on 4/15 and 4/19 are already full, but if you’re interested in attending either the Sunday 4/22 at 3pm or Thursday 5/3 at 7pm parlor meetings, there’s still some space. Just email us at info@villagepdx.org to RSVP and get directions. We know from talking to the founders of some of the existing villages on the East Coast that they have been expanding their villages’ boundaries to include surrounding neighborhoods/ townships. But I don’t know how to apply that information to thinking about villages here in Portland. Q: What neighborhoods are included in NEST? Q: Why not include all of Seattle? A: The richness of the village concept is that it is rooted in a given geographic area and engages residents of all ages to volunteer in their neighborhood. If the area is too large, the power of building neighborly connections is lost. We hope that NEST can inspire other areas of Seattle to develop their own village and we could work collaboratively to build a supportive network. Currently, there is discussion at the Phinney Neighborhood Center (NW Seattle) and on Bainbridge Island about starting such villages. So, the long and the short of it seems to be: “The richness of the village concept is that it is rooted in a given geographic area and engages residents of all ages to volunteer in their neighborhood. If the area is too large, the power of building neighborly connections is lost. ” On the other hand, as we have learned from our talks with some of the village founders, if the geographic area is too small, there may not be enough interested residents to join the village and keep it going. Which makes this all sound more than a little like Goldilock’s search for the “just right” sized bed. I know there are approximately12,000 residents aged 65-plus in the section of Seattle that will be served by the NEST village. So population may be one way to look at it. I also know that existing resources for seniors available in the area factor in. Maybe printing out a map of Seattle so I can see how much of the city the NEST village will encompass would help? If you have suggestions about how to think about this–or explain it better—please let me know!